In her acclaimed debut, The Cutout, former CIA analyst Francine Mathews defined a world of intrigue where only the savvy survive. 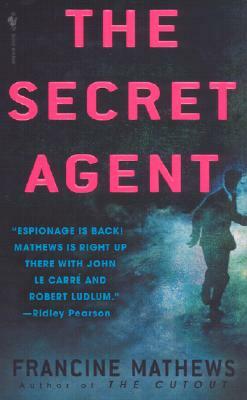 Now, in The Secret Agent, Mathews propels us deep into the baffling history of a maverick American’s glittering life and his sudden, cataclysmic disappearance…. Here is the masterful story of secret agents of many kinds--in a realm where truth is the most dangerous secret of all. Trained by the OSS, Jack Roderick plummeted into Bangkok one rainy morning in 1945 and never left. Silk King, pirate, ruthless collector of beautiful objects--especially women--Roderick was feared and respected as a foreign spy, a business kingpin, and a trader in men’s souls. And then, at the height of the Vietnam War, caught in a killing web of treachery and revenge that would determine the fate of his only son, Rory, Jack Roderick walked into the jungle…and vanished from the face of the earth. Four decades later, can the mystery be solved? International fund manager Stefani Fogg is recruited by a man whose job it is to know the unknowable. Wealthy beyond corruption, impervious to romance, and equipped with a mind that can crack any enigma, Stefani signs up for the adventure of a lifetime: playing Secret Agent to Max Roderick, grandson of Bangkok’s long-vanished Legendary American. A world-class skier tangled in a sordid Thai murder investigation, Max is consumed with the riddle of Jack Roderick’s disappearance--and with his own father’s death in the jungles of Vietnam. Seduced by Max’s charm and intrigued by his family history, Stefani ignores the warning signs and follows her heart. But when Max’s quarrel with the Thai police turns deadly and a killer strikes, she knows she must return to the place where it all began, to unravel the lies, penetrate a deadly conspiracy, and expose a killing truth. She flees Max’s France for Bangkok’s khlongs--into the ruins of the Silk King’s dark past and the mesmerizing shadow of the Roderick family curse. What she finds, in Jack Roderick’s story and in the fate of his fighter-pilot son, is an American dream that crashed and burned in the rice paddies of Vietnam and a chilling legacy that haunts our own to this day. Propelling us masterfully through half a century, from Manhattan to the Alps to the colorful and treacherous heart of Bangkok, and based on the life of American expatriate Jim Thompson, The Secret Agent is at once a murder mystery, a touching love story, and a lavishly atmospheric journey through the exotic landscape of love and history--an historical thriller of the first rank. Francine Mathews spent four years as an intelligence analyst at the CIA, where she trained in operations and worked briefly on the investigation into the 1988 bombing of Pan Am flight 103. A former journalist, she lives and writes in Colorado.